Here we have photos taken during our visit in 2003 and some also from 1964. The rooms are in the sequence in which tourists are taken. We now have new photos from our visit in 2005. Peterhof was begun in 1705 shortly after the Russians captured the Neva river area from the Swedes. The Monplaisir and future grand palaces were the first built. But major work was undertaken from the first on the huge waterworks necessary to feed the many fountains an cascades. The main palace was completed with ceremony in 1723. But many additional buildings followed over the next 2 centuries. While the monarchs also resided at their other favorite palaces, Peterhof remained the most important for formal state occasions. It was mostly destroyed by the Germans during World War II, but has now been largely repaired at tremendous cost. One wing of main palace - detail of the imperial insigna above the cupola. The weather vane is a gilded double-headed eagle. Rear side of the main palace as we walk around to gain entrance. View from palace front down across the cascade and fountains before they are turned on in the morning. The upper level promenade outside the palace above the cascade and fountains before they are turned on. One wing of the main palace facade toward the church. View from the palace over the cascade before the fountains are turned on. Now there is the reflecting pool but in Peter's time this was a canal opening to the Gulf of Finland and his small ships could deliver people directly up to the palace. The canal is lined by 22 marble basins that spray water. At the near end are the twin Neo-classical colonnades designed by Voronikin. One wing of the main palace toward the church. View of the central cascade with fountains and statues from below toward the main palace. There is a grotto behind the cascade. Statue of Hercules on palace grounds. A small army of young students doing groundskeeping chores near the palace. A Roman fountain designed by Ivan Blank and Ivan Davydov in 1738-9 - One of the many fountains on the grounds. A checkerboard cascade lined with statues of Roman - Greek gods and goddesses. A reenactor in uniform of Preobrazhenski Guards Regiment. He is playing Peter himself.. He is standing in garden in front of the Monplaisir palace that Peter designed for his personal use. The Catherine wing built adjacent to Monplaisir for Empress Elizabeth in 1740's by Rastrelli for court balls. But Catherine II remodeled it in 1780's. She was living here in 1762 when informed about Orlov's coup deposing her husband, Peter III. In 1785 Catherine employed Giacomo Quarenghi to redesign the interior in neo-classical style. The interior is open to public and contains period furniture and several dinner services including the famous Guryev of 1000 items. This was commissioned by Count Gouriev, 1809-1817 for Alexander I.. There are portraits of Alexander I and Catherine II and their furniture. The sea side of Monplaisir palace. Peter enjoyed watching naval maneuveres from this terrace. The grand fountains at foot of cascade in front of the main palace. The original lead statues were replaced by 37 cast bronze ones gilded. This Grand cascade is fed by pipes from the Ropsha hills at least 14 miles distant. It was built between 1715 and 24 with 64 fountains and 142 water jets. George Gordon made this photo lining up the statue, fountain and canal toward the Gulf of Finland. By shifting position slightly George shows how the canal reaches the sea - Peter originally designed this so that ships with visitors could float right up to the palace. George's photo of the fountains and part of lower garden. George's photo of the palace above the fountains. George's photo viewing the fountains and lower garden to left of center. George's photo of the fountains with main palace behind and above. George's photo of the fountains and canal from different viewpoint. George's photo showing how the palace might have looked to visitors as they entered the canal from the Gulf of Finland. The fountains in front of the palace. Here on the right we see the statue of Sampson opening the mouth of a lion. The lion is the heraldric symbol of Sweden and the battle of Poltava was won on St. Sampson's day in 1709. Note also the entrance to the grottos. The lower grotto has some of Peter's trick fountains. Close up of the famous Sampson statue and fountain in the pool at baseof the main cascade. The lion represents Sweden and the great victory at Poltava in 1709 came on St. Sampson's day. Statues and fountains in front of the palace part of the Grand Cascade. Close view of the church wing of the main palace. Another closeup of the domes atop the church. The rear side of the palace. The full length of the rear side of the palace. Here we were jumping the crowd in front by going around to the back to be let in by special permission. Entrance to the bottom of the grand staircase. This was designed by Bartolomeeo Rastrelli and was the official entrance for ambasadors and court. It is lavish, decorated with caryatids and carvings. Part of ceiling and one wall above the landing of the staircase. View down the stairs toward the entrance. View up toward the landing of the staircase. It was not possible to find a place from which to photograph the staircase in its entirety. But from here we can see one of the four wood-carved and gilded statues representing the four seasons. Painting on the ceiling above the staircase. This depicts Aurora and Genius driving away the night. The first room tourists enter is the Blue Reception Room right where the Imperial secretary used to check and approve visitors. Gallery of paintings of Russian naval victory in the Chesma room. This was the victory over the Ottoman Turks at Chesma Bay in 1770. 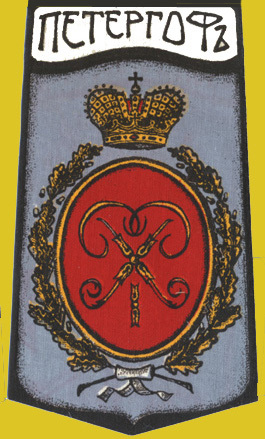 Count Alexeei Orlov was the Russian naval commander. The paintings are by Philippe Hackert. Unfortunately I was not able to make good photos due to lighting and flash problems. The main ballroom situated at right angle to the length of the palace. It is seen here from the Chesma Room and tourists are not allowed to go in. It was recently restored. Crowd gathering in throne room waiting to go to Chinese room - admiring portrait of Catherine II. The throne is situated below the portrait. This is the famous painting byh Vigilius Erichsen showing Catherine returning from her successful coup in St. Petersburg i n1762. She is riding "Brilliant" and wearing the uniform of the Preobrazhenski Guards Regiment. The painting is much copied. Below it behind the crowd is the corronation throne of Tsar Nicholas II. It was created in Moscow using birch, bronze, and silver in 1894 based on Byzantine designs. Painting on ceiling of Audience hall. Formal White dining room with the 196 piece Catherine Dinner Service made in England. Doorway into the Western Chinese study. These were designed by de la Mothe in 1760's. Another view of the Western Chinese room. View from Chinese study through door courtesy of Denna Buckner. Detail of floor in Chinese study. Stove in the Western Chinese room - lighting makes photography very difficult. The Picture Hall is at the center of the line of rooms. Entire wall is covered with 368 portraints of eight court women painted by Pietro Rotari in various costumes between 1767 and 1782. The room is also called Rotari Room and was designed by Rastrelli. Passing through the Eastern Chinese room. This room was changed radically. Interior of Chinese study- courtesy of Denna Buckner. The Partridge Drawing Room with wall coverings of fabrics with designs of garlands of flowers, ears of corn and partridges on a pale blue background. The west wall is origianal silk and the others are new silk made to match. It has a harp made in London and Meissen porcelain. Another of the large stoves, in Catherine's Dressing Room. The Study contains portraits of Alexander I and Catherine II and a bust of Voltaire. Another view of the Study. The Standards room, in which in Imperial times the regimental banners of the Peterhof garrison weere displayed . The Equerriers - Caviliers - Room where the duty aides-de-camp hung out. The lobby between the Cavalier Room and Blue guest dining room. The Blue Guest Room or Dining Room designed for Tsar Nicholas I for banquets. They used the 'Cabbage service' seen here on display - it has 5550 pieces. There are portraits of Maria Fyodrovna and Catherine II. View from the Blue dining room through door into rooms still being restored and not open to tourists. This is the last open room on the ocean side of the palace. Another large stove in the corner of the Blue Dining room. A portrait of Maria Fyodrovovna adorns the wall. Another view of the Blue dining room with Cabbage Service. A theater or concert hall located behind the Blue dinning room. At this point the tour turns right to pass through the series of rooms on the upper park side of the palace. Portraits in the first of the open guest bedrooms. Gold decoration on walls of one of the series of guest rooms. Portrait in one of the guest bedrooms. Detail of the wall covering in one of the guest bedrooms. Another view of guest bedroom with furniture and usual heating stove. Guest bedroom - view of canopy bed. This alcove is the one directly behind the alcove in thee Divan Room. This room was called the Crown Room because the Imperial crown was kept here whenever the Empress or Emperor were in residence. Carved oak wall in Peter's study. The oak room is one of the only rooms surviving from Peter's time, designed by Le Blond. The paneling was carved by Russian masters using design of French sculptor Nicholas Pineau in 1718-20, but only 6 of the original 12 remain. The others are replacements. Peter's desk in his Oak room study. One end of the palace - imperial insignia above. This is the end opposite to the church end. Inlay wood floor in throne room. Photo graciously supplied by Deena Buckner. The cascade and fountains in front of the facade of the Peterhof palace. All this was ruined by the Germans who occupied the area during the siege of Leningrad. It is being restored at enormous cost. This photo was taken during visit in 1964 when restoration was only beginning. View of a part of the formal gardens and fountains in front of the main palace at Peterhof in 1964. View of Peterhof palace interior ceiling being restored in 1964. Peterhof palace - main facade with staircase and fountains viewed from beside the grand canal. Note the marble basins lining the canal..
Peterhof lower palace gardens seen from above the cascade fountains. One arcade is across the main basin. George's photo of gardens and adjacent dinning building. George's photo of a shady lane in the lower gardens. George posing in front of one of the Roman fountains. George's photo of flower bed.